In the 3rd Century the Romans drovew out the Gauls and this area became an important area to the Roman Empire in terms of their conquest of Europe. When the Roman Empire fell, the area was controlled by the Goths and the Langobards. In the 13th Century the powerful Visconti Family of Milan unified this area. The region came under German rule and came back to Italy in 1859. Today, lots of farming in the region, tourism, especially in the lakes district is very important. Milan is an economic centre for the country. You will get the feel when you drive one of the autostradas across the flat land towards Milan. The traffic just keeps getting more and more intense. Also known as La Città dei Mille. the City of the Thousand, is 40 km northeast of Milan. The Venetian walls of the Città Alta (Upper City) are listed as UNESCO World Heritage Sites. There is the Città Alta and the Città Bassa (Lower City) which is more the financial centre. Bergamo is the second most visited city in Lombardy, following Milan. 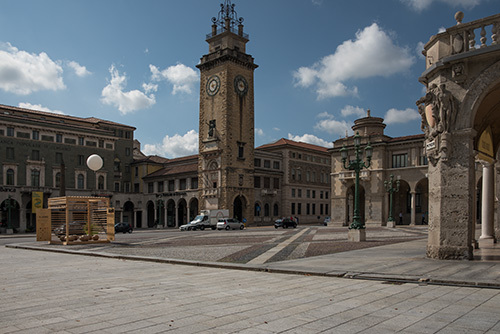 Bergamo was one of the few Italian cities that did not suffer major destruction during World War II. We have been to Bergamo twice, and on our 2017 visit we stayed in the upper city, which is surrounded by Venetian walls build in the 16th century. The Basilica di Santa Maria Maggiore was built in 1135 with construction continuing into the 15th century. To the site is the Battistero, the Baptistry. A beautiful octagonal building that dates back to 1340. Also, beside the Basilica is the Bergamo Cathedral which was built in the 17th century. The upper city is accessible from the lower city by a funicular. If you book a hotel, ask about what parking arrangements are available. The streets are lined with trendy stores, there are plenty of good restaurants. I wanted to re-visit the Piazza Vecchia. It is a stunning piazza lined with classic buildings. Before going to our hotel in the upper city we spend the day in the lower city. I wanted to visit a pen store which was located in the business district. The lower city that started to take place in the 19th century. There is plenty to see in the lower city, the architecture is impressive and this is where you will find the larger retail stores. There are trendy restaurants, for the business clientele. We had a very good lunch. I must admit, Cremona was one of those pleasant surprises that come along in your travels. In fact, we never even planned to stay here. It was just one of those days were we had driven too far and it was time to stop. We were very pleased we did as Cremona is a beautiful city. The city has fame four its cathedral, nougat and violins. It is here that Stradivarius and Guarneri made their best violins. It is an easy city to walk about. If arriving by train there are numerous buildings and piazza all with examples of elaborate terracotta ornament. We were taken with the use of red brick which gave the city a very warm feeling. Although we arrived by car, there is frequent train service from Milan, about a two hours trip. The rail station is worth a visit and it is located north of the centre of the city at the end of Via Palestro. The Piazza del Comune is the centre of the town. We found the architecture to be stunning, especially in the early morning, as depicted in the cafe scene we captured early in the morning. There are great contrasts in colour and texture in the buildings with the use of red brick giving off comfortable tones, and white marble used on many of the larger buildings. The Torrazzo is the tallest campanile in Italy with a height of around 364 feet. 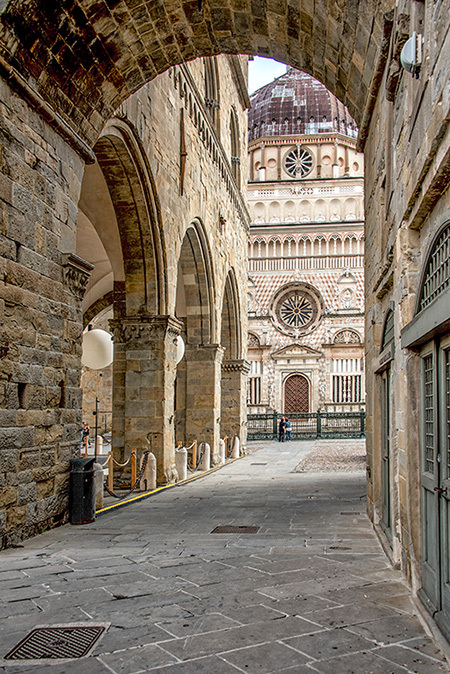 Don't miss the duomo, the Battistero di San Giovanni (dating back to 1167) and the Loggia dei Militi (dating back to 1292). 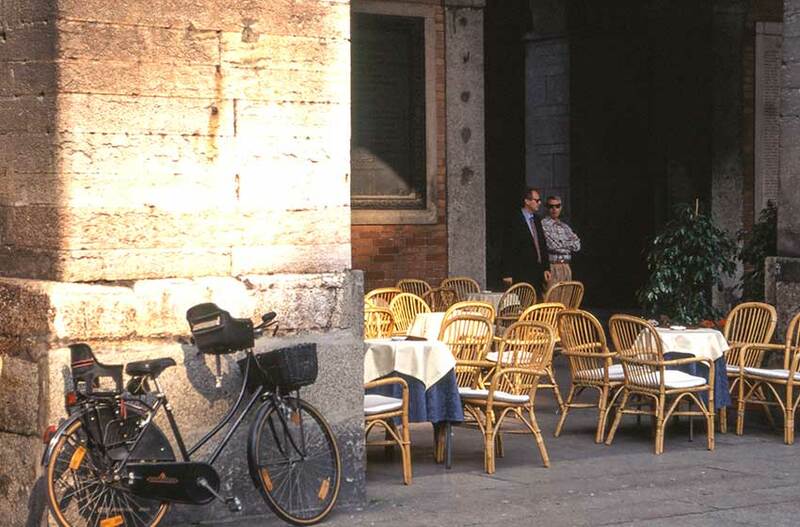 The Palazzo del Commune is open during specific times and now the town hall for Cremona. 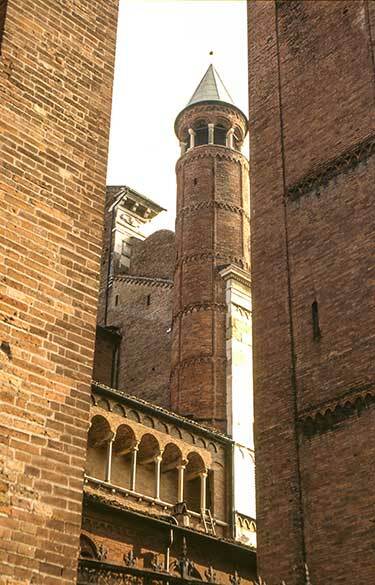 Cremona is a town where if you can see past the large doors/gates of the homes there are elaborate inner courtyards. North of Cremona is the Rocca Sforzesca, the largest of the surviving castles in the area located near Soncino, a walled town that was built in the 12th Century. Often when I talk with someone as to their plans to Italy, the locations include Venice, Florence, Rome with the comment "there is nothing much to see in Milan". How untrue. In fact. I owe my first trip to a large poster shot of the Galleria and my plan to go there as I was sure that must be one great pen store inside! There is Leonardo's famous "Last Supper" on the walls of the church to see, La Scala and the Duomo in addition to the Galleria to see. Yes no need to spends days in the city, but I would not write the place off. The centre of the town is the Piazza del Duomo, and it is quite the site. The Duomo is the 3rd largest church in the world (St. Peter's and the Seville Cathedral outrank it in size). There are some 130+ spires covered with over 2200 marble saints and enough gargoyles to keep your camera busy for some time. No three aisles in this cathedral, there are five and the inside of the cathedral appears to stretch out forever when you first enter the church. The stained glass windows are impressive. A trip up to the roof takes you behind the spires and gives a great view of the piazza and the city. 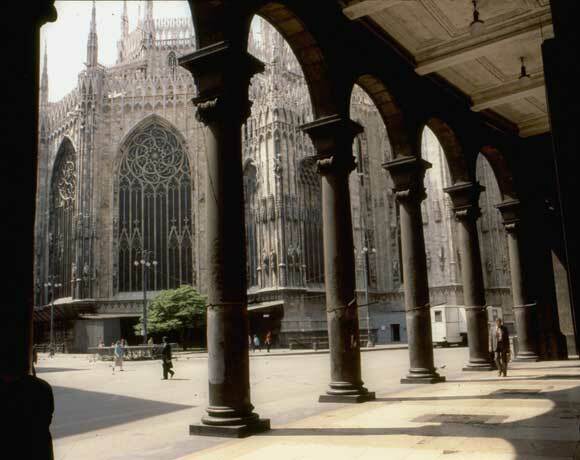 The Palazzo Reale is located on the south side of the cathedral has was the home of Milan's rules for centuries. On my first trip to Milan I made the mistake of being there on a Monday. The Museum like just about everything else will be closed down on that day. 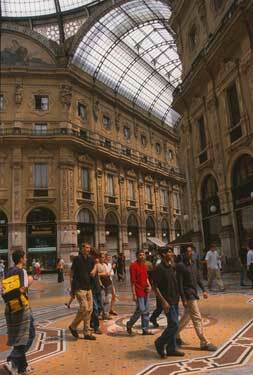 Of course I traveled to Milan to see the Galleria - a massive glass-covered arcade and links the Piazza del Duomo and the Piazza della Scala together. The Galleria was designed by Giuseppe Mengoni who fell from the roof and died just the day before it was to be inaugurated (1878). Karen and I enjoyed a light, but expensive lunch, at the one of the restaurants in the arcade. How much can they charge you ask? Well quite a lot. On my first visit I was luck to see da Vinci's Last Supper which is in the refectory of the convent of Santa Maria della Grazie. My first trip to Italy was notivated by a picture of the Galleria Umberto in Milan.
. I saw it on the Sunday when I arrived in town - it also is closed on Mondays. Shortly after it was unavailable due to the years of work for cleaning. It would be work a visit to return to see it again. Of course when in the area make sure you make time to visit the Certosa di Pavia.We remember our drive down the long straight road that is lined with poplars. At the end there is the main gate. It was locked when we arrived, but we waited for the opening time and then proceeded through the gate into the vestibule with its frescoes and once on the courtyard the front is right there. The front of this monastery/church is stunning. It is covered with Candoglia and Carrara marble. All carved with enough detail to keep your eyes busy for hours! Some travel books note the Certosa as the greatest decorative masterpiece in all of Italy. We've seen a lot, and this is right up there at the top. The main cloister has long arcades and around that are a number of house-like cells for the monks. Each cell/house contains its own chapel, a study/dining room a bedroom and a private garden. The monastery dates back to 1390s and it took over two hundred years to complete. At one point in his history, Napoleon disbanded the monastery, but then in 1968 a group of Cistercians again occupied the Certosa. Plan your time accordingly as the Certosa closes from 11:30 to 2:30 pm. You could travel from Milan but it is a 1 1/2 km from the nearest bus stop. Boy, here was another great surprise. We had researched this area so we knew we were heading towards Montova but when we got there, well it was great. Mantua is located about 25 km from Verona and has frequent train service from Verona, Milan, Modena and Cremona. We found a great place to stay Villa Schiarino Lena. The city is surrounded on three sides by the Minicio River. That helped to establish its safety for centuries. Frederico II hired an assistant of Raphael (Giulio Romano) to decorate his palace, the Palazzo Tè. The name, has no connection to tea, rather it is named for tejeto - the local name for a drainage canal and that is because it was built on a swamp that was drained.